« Will Karl Rove Tell Us It’s Too Late for Christie Too? This entry was posted on Sunday, October 2nd, 2011 at 01:15 and is filed under Election 2012, Media, News, Politics, Sarah Palin, Update. Well, that’s certainly going to leave a mark, assuming this isn’t some contrived head-fake. H/T to poster Michael Wiley for pointing this out last night! As I commented yesterday, this could well be the reason behind his panic and angst. The face that screams "Please, punch me!! Not that i would ever DO anything like that, mind you! He has to be freaking out about this. He has been ABP since forever. I listened to his radio show a couple of times way back when he was promoting someone else before Perry. He defiantly has had PDS from way back, but it was more subtle. Erikson is right up there with the RINO elite. I expect that Erikson will move on to the next 'flavor of the month' when Perry's poll numbers are somewhere around Bachmann's, which is going toward the bottom of the GOP POTUS contender pack. We, the people, have been doing our own hard work at vetting candidates and exposing their records because of people, like Erikson, who have a vested interest in pushing their own RINO agenda and who won't publish the truth about their preferred candidate. Erikson, and people like him, are fighting a loosing battle. We are done with being manipulated by media hacks! I'm very suspicious of the results of this poll having as much visibility as it has on Redstate, given it is seemingly so counter to everything that Erikson seems to be pushing. Maybe it doesn't matter that much but has he ever given reasons for his PDS other than the usual Progressive talking points? He is certainly doing it to draw traffic and is it possible that he is trying to generate centrist cred to expand his viewership? Kind of like Barry the Man-Child (who is married to Michael – no wonder he opposes DADT!) tried to do with his base until it became obvious that he was losing even them. In my view, anyone who opposes Palin's ideology of small government, anti-Crony Capitalist/Permanent Political Class constitutional conservatism which, after all, was the ideology of our Founders, is a Progressive. I would call our side Constitutionalists. Maybe the 2 labels don't roll right off the tongue but they are very descriptive. And I believe that this is how the two party system is going to evolve in the run-up to 2012 and after, when the Constitutionalists as led by the Tea Party wake up the sleeping giant called the American Patriot and win an election of epic proportions in the history of our country. I believe this is how Palin is looking at the situation. Does anyone who has been following her believe that she doesn't fully appreciate the overwhelmingly history changing gravity of the situation? We're talking about reversing a Progressive course that has been going on in our country for half its existence! As bad as it has been for her and her family up until now, we haven't seen anything like what she and they will be subjected to when (not if) she tosses her hat into the ring. Ever. She is literally giving up life as she has known it. And they wonder why it isn't a simple decision for her? And even if she has already decided, I have complete trust in her political instincts to know the exact best time to get 'er done. I can see November, 2012 from my house. Incidentally, the above photo of Governor Palin is an admitted photo-shopped image created several years ago by one of the Alaska Mafia crones. These people are so remorselessly childish. Have to feel a bit sorry for Erickson, however. Governor Palin has already earned an honorable place in the history of our country. Within a year or so, this pudgy fellow will fade away like the Wonkett guy. Want to know when Erickson's hatred of Gov. Palin really started? It started in early 2010. Erickson traveled to South Carolina to attend a rally for Nikki Haley when she was running for Governor. Seems that Governor Palin did now show sufficient deference to Lord Erick and he has had a hatred on for her ever since. It's a shame that he is basically destroying what once was a terrific conservative site. Until he lost his mind and his integrity, Red State was the first site I hit every morning. It has now become a joke. 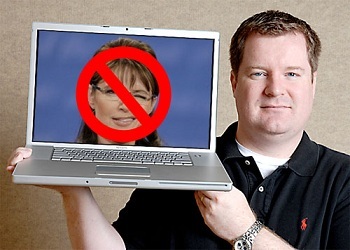 If you are even thought to be a Palin supporter, you are ridiculed to the point to saying; "to heck with this garbage" and leaving the site as I did. I wish I was computer literate enough to know how to block the site just in case I was ever tempted to go back. One of the things I have always loved about being a conservative is that even if another conservative disagrees with you, they will still listen to your reasoning and offer another view. That is no longer true at Red State. Red State should change its name to Rino State.That would be a much more accurate name.